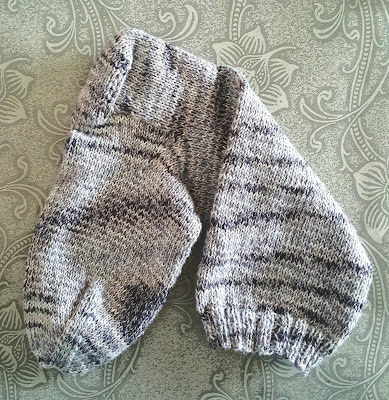 A humble handknit sock, the first one of my first pair in about 10 years. I feel a bit of a commitment to handknit socks now, though, whereas in the past I was experimenting with various handspun yarns, which weren't really sock yarns to begin with. Anyhoo, I'm having fun again with this endeavor. I'm also using this first pair to try a few different ways to do the customary things on handknitted socks, like cuff, heel flap, and toe. I want to get myself setup with a template that works for me, and always do that. Boring to do the same thing, you say? I like routine. There's a lot of freedom in routine, in not having to make decisions all the time because things are changing up, often unnecessarily. Anecdote from life: I make pancakes for myself every weekend, and I use the same basic recipe every time. I love them. I have no interest in experimenting in the kitchen with fancy recipes to make something so basic. That's just me. In other news...the summer was so wacky here, i.e. there was hardly one at all and most days were overcast, that all my Christmas cacti are blooming now!! Don't fix it if it ain't broke, they say. I too am a routine sort of person. Not that I don't go outside that box to experiment. But once I've got something down pat, there is a certain comfort to being able to go to it and do it without a lot of thought. Socks for sure must fall in this category. Just the different yarns and colors should be enough variety. Similar story here in Idaho of a lost summer but now a quite nice fall. Trying not to look back with sadness but being grateful for what this new season is offering. I like your sock very much. What I don't like about the socks I buy is that the cuff if too tight. Sock used to have just the knitted extension w/o elastic, but now the added elastic creates an indentation on my leg. Bah! At 35x2 I haven't given up on incorporating more routine in my life. If I can routinely watch my baseball games, then maybe there's hope! My morning walks surely qualify. It's a start. Now there's a talent I have never developed... knitting. I do love to see hand knit work, and yours is lovely. As for routine, I'm all for it! Oh, I experiment with things from time to time, but love a regular schedule, a fairly regular menu, etc. As for the seasons, we've had a good summer with monsoon rains, and now the temps are cooling. The trees are starting to turn and the days grow shorter. Everyone here with apple trees has had an abundance of fruit this year! But it's time to bring out the warmer clothes and start preparing for autumn and winter. Enjoy those socks! How great to get these socks truly custom...perfect fitting toe and cuff. I too like routine...it feels good to have order and receive just what you like. I'll be smiling this weekend over my favorite pancakes!